Last month I attended a Tea at the Plaza Hotel in New York City along with other writers from The Chicago Moms, Chicagonista, and NY Metropolista. The event was sponsored by Dyson, and it was a lot of fun, but I have to back up for a second. The Plaza Hotel has had a special place in my heart since childhood. My sister and I were big fans of Eloise, a fictional character created by author Kay Thompson and illustrator Hilary Knight. We had still have the original Eloise book, and as daughters of a hotel manager, totally loved the story about this precocious little girl who lived at the Plaza with her dog Weenie, her turtle, Skipperdee. and her British nanny. On my first visit to New York (I was thirty! 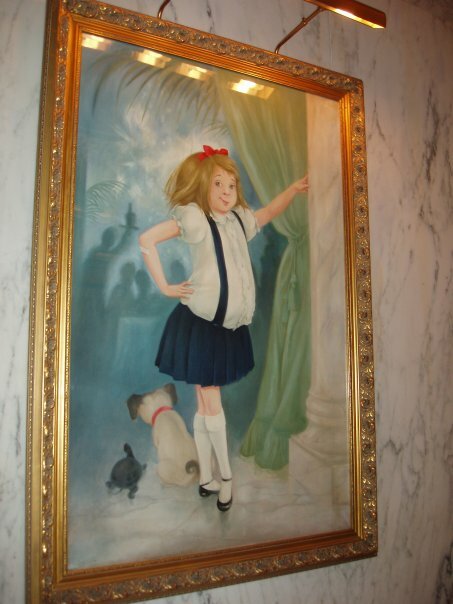 ), I absolutely had to check out the Plaza, where a huge painting of Eloise hangs. It makes me smile. I actually make a point of “visiting” Eloise each time I go to New York. I took this picture of it on my trip in 2009. Though I go to the Plaza each time I hit Manhattan, it’s, as they say, “too rich for my blood” so I don’t do anything more than take pictures like the tourist that I am. When we arrived, I felt like I was in a dream. The room was just as beautiful as I remembered from the last time I walked by, only this time I was one of the lucky ones grabbing myself a seat. The place settings were simple and lovely. The centerpieces? So creative: they were the new Dyson Air Multipliers, which are bladeless fans. Very cool! I enjoyed perusing the menu as I chatted with those around me, including Valerie from Dyson. The Plaza’s Signature Blend Tea was, of course, delish. I don’t know a lot about tea, but I do know what I like, and I like sipping the Plaza’s Signature Blend while sitting in the Palm Court, socializing with other people. The food? So small, yet so good. It was a great afternoon. I met so many folks who were new to me, including Andrea Metcalf, fitness expert, personal trainer, writer at Oprah.com, and contributor to NBC 5 in Chicago (The Fitness Team!) as well as the Today Show on occasion! I’ve seen Andrea on television so many times in workout clothes that it took me a few minutes to recognize her all dressed up, but once I did, I introduced myself and we had a lovely conversation. (Preview: I’ll be reviewing Andrea’s soon-to-be-released fitness DVD set in the next couple of weeks!) I was happy to be able to sit and chat with MJ Tam (Head Chicagonista), too, because she is usually speed-walking right past me at other events, taking care of business! Not on your life, buddy. Nice try, though. P.S. I could get used to having tea at the Plaza. Just sayin’. That really sounds fabulous. I would love an air multiplier for Jacob, I think it would help with all his allergies, not to have the dust and pollen on the blades, but they're too rich for my blood. Have you seen the Eloise movies? We love them. So wait a minute?!?! They didn't even offer you one to give away to your blog readers?!?! WTF!! !